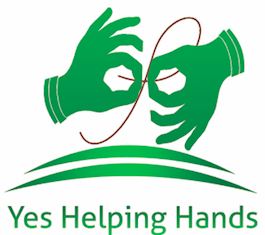 Yes Helping Hands (YHH) was established In 2011 as a non-profit organization and non-Governmental organization. We aim to challenge the discrimination they face in mainstream Nepali society and help them enjoy an independent life. Our innovative enterprise began with helping blind, deaf people but now we extend opportunity to people facing a range of disabilities. We offer free practical and employment opportunities of training in Handloom weaving for Blind, deaf and people with physical Disabled and then the chance to earn income by working with us. This Increase the self-esteem of disabled people and also improves the way they are treated by their family income and improve their overall standard of living. All products sold in our store are hand made by blind, deaf and people with disabled. Products are available in handloom weaving, Natural threads and azo free hand color dyed pashmina/cashmere threads. We are proud to be present our catalogue of products which is made by deaf and blind artisans Using natural and azo free hand color dyed threads .The products have exclusive various of design Color and quality. We are committed to provide our customers with high quality products and services. Your suggestion and feedback on our products are highly appreciated. We are very thankful for our customer, supporter and beloveds for your support and contributions.